A journey to the North, Central and South America. Welcome! 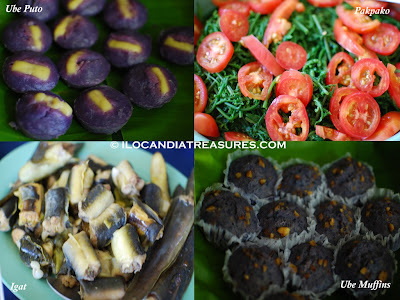 Treasures of Ilocandia and the World is a culture and travel blog. Edwin Antonio features the Iloko culture, places, traditions of the Philippines and showcases festivals and other celebrations of life of the country and the rest of the world. Before we did the pictorials of the indigenous elders in the town of Dumalneg, Mrs. Espiritu, the wife of the mayor hosted us snacks with ube puto and ube muffin. Both were really good. You can savor the pureness of yam. The puto was even topped with cheese. It tastes so delicious. These delicacies are available by order basis only. After the exciting pictorials, we were served with lunch. The lunch was composed of vegetables and exotic food. They served us nutritious red rice, igat or eel, pakpako salad or wild fern, igado, chopsuey, inabraw nga sabong ti karabasa, and grilled chicken. I enjoyed the food so much. It’s not only food that you can enjoy here but you can also experience the hospitality of the people.